The Blue Studies International - Colombia Bogota Bombers arrived with a much smaller team including Chris Payne, Travis Crockett and Gaelic convert Liam Oh Konel, but no Paddy Quinn or newcomer Dylan Carter. They were a bit more relieved when Andrew Fletcher and previous Bombers stand-in Nimesh Perera arrived just before kick-off. Eventually both teams were able to field a side with a healthy number of subs and the game began. Springing to an early lead the Aguilas kicked a handful of goals and you could see that the Bombers were uneasy. 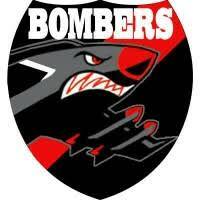 The Bombers dug in, adjusted their team and scored some responders by C Payne and Liam. Nimesh started well in defence but after pulling a muscle had to retreat to the forwards to give him some space. The Bombers came ahead by 2 behinds with the score 30-32. The second quarter was similar to the first, with both teams struggling to maintain an advantage. Aguilas loan player Oscar Marin played well up front and netted a goal, alongside James Moore. Both teams scored 3 goals apiece with the Bombers again ahead on the balance of behinds ending the half 50-53. The third quarter began to open up for the Bombers even though there was a great level of defence by Torres Sergio and Miguel Pacheco Sailaku both defending for the Aguilas with tenacity. Fletcher buggered up his foot, and moved to the front as well, hoping to continue on. Liam continued to play well up front scoring a couple of goals and landing a beautiful mark over the head of Paddy. The game ended with the Aguilas 10 points behind, scoring 2 goals to the Bombers 3. The start of the fourth quarter while still ahead, was looking shaky for the Bombers. Fletch had to pull out as his ankle continued to hold him back. Will Keech was playing well up front, and Trav was having to play extra hard to keep it together. The Aguilas got up 4 goals to the Bombers 1, and it was looking like they were going to come up over the top. 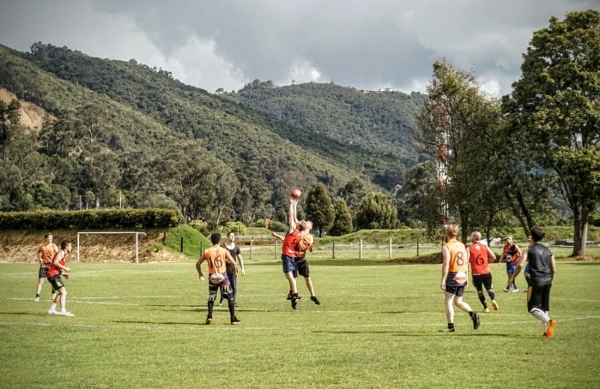 But the game turned with 2 goals being snatched by the Bombers to put them above and then another 2 nailed through for good measure by Liam Oh Konel to take the game home for the Bombers and jettison them into the Grand Final against the Bogota Craft Beer Tours Bullants.